Joanne Chang of Flour Bakery + Cafe and Myers + Chang in Boston, Mass. Photo credit: Colin Clark. What do you love best about the city’s food scene? I’ve seen it change and develop so much over the last 20 years. I love the passion that exists among the chefs and restaurateurs I know; everyone is deeply committed to offering excellent service and personal and crave-worthy food. We all know each other and we all support each other. I think that’s pretty rare! Giulia: all pastas and desserts. Ostra: sea bream, crudos, pea green salad. Sam’s: salt and pepper shrimp, octopus with black rice. Taiwan Cafe: mapo tofu, hakka eggplant, pork + tofu + yellow chive stirfry. How fun! Breakfast would start at Mike’s with a huge stack of pancakes. I love pancakes! Mid-morning snack would be at Sofra Bakery; they have an amazing selection of pastries and snacks. Lunch would be everything off the menu at Cafe Sushi. I never have enough room in my stomach for all the incredible sushi Seizi makes, and for this day, my appetite won’t let me down. I would stop at Picco for a mid-afternoon ice cream pick-me-up … three scoops: coffee, chocolate sorbet, something fruity. For dinner, I would go to Giulia for every pasta on the menu and then I would end at the North End for pizza at the original Regina’s. For dessert, I would go to Toscanini’s for more ice cream! If you had to name one personal favorite from Flour Bakery and Myers+Chang, what would they be and why? 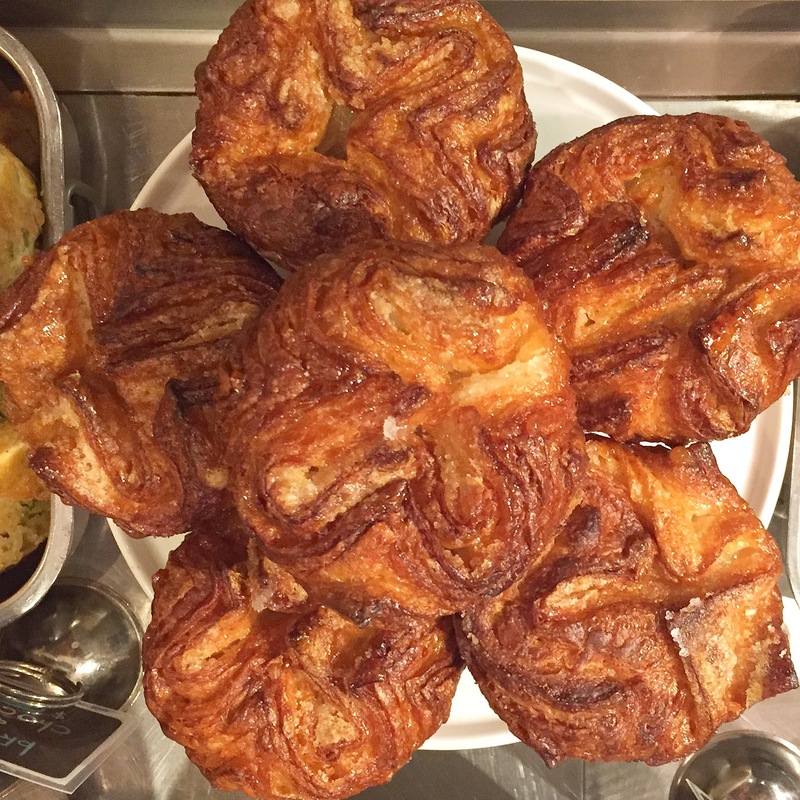 My favorite Flour item is our kouign amann. It’s a buttery, sugary, crispy, caramelized croissant. Or maybe it’s our pain aux raisins: brioche with pastry cream and golden raisins. 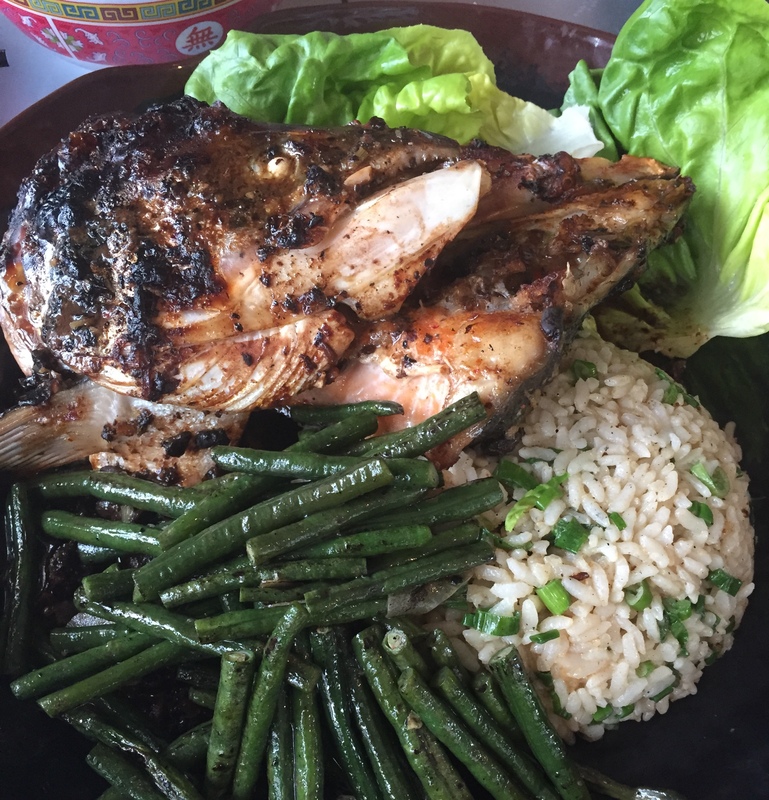 My favorite M+C dish is our salmon head and tail with black bean sauce, miso fried rice and garlicky green beans. You have to really be into picking around the head and tail. It’s pungent and spicy and full of amazing flavor. Describe the Asian food scene in Boston. Do you have any favorites you like to visit when you don’t feel like cooking at home? Asian dining is mostly limited to Chinatown or Dorchester with a few exceptions like M+C and Blue Dragon. We go to Dumpling Cafe and Taiwan Cafe a lot. I love Italian and sushi. [For] Italian, Giulia for sure, the whole pasta menu. Cafe Sushi for sushi; they have a changing signature sampler and chef’s sampler. I get both every time we go. Sweets are your specialty. Are there any restaurants where you always make it a point to leave room for dessert? I always have dessert at Ostra. Their pastry chef is really talented, and I love the verrines and the snow egg (meringue with lemon). I love Chinatown. We have a good selection of Taiwanese, Cantonese and Vietnamese restaurants with a few Szechuan and Shanghai restaurants, as well. It’s always busy and it’s always fun. Dumpling Cafe, Taiwan Cafe, the Chinese BBQ place on Essex and Lincoln … it doesn’t have a name that I am aware of. Rialto in the Charles Hotel is excellent, as is Henrietta’s Table. Bar Boulud in the Mandarin is lovely. Meritage in the Boston Rowes Wharf Hotel is excellent, as well. *Editor’s note: Since original publication of this interview, Rialto has closed. What’s your guilty pleasure and where in Boston do you go to get it? The chocolate sorbet at Picco. Rick Katz, the owner, makes the best ice cream in town, but it’s this incredibly rich and decadent chocolate dessert that I can’t get enough of. It’s like eating the best bittersweet chocolate bar, but frozen. Indian pudding! Basically cornmeal cooked with milk and eggs and molasses. Boston cream pie from Flour. Island Creek oysters. It sounds hokey and I’ve actually never done it, but go on a duck tour. I’ve had friends from out of town go and they always call it a highlight. You get to see a lot of Boston and you go on the water, which gives you a wonderful perspective of the city. Myers+Chang, 1145 Washington Street (South End); Asian, lunch Monday-Friday, dinner daily, dim sum brunch Saturday-Sunday. Giulia, 1682 Massachusetts Avenue, Cambridge, MA (between Porter and Harvard Squares); Italian, dinner only Monday-Saturday, closed Sunday. Sam’s, 60 Northern Avenue (South Boston Waterfront); American, lunch Monday-Friday, dinner daily, brunch Saturday-Sunday. Cafe Sushi, 1105 Massachusetts Avenue, Cambridge, MA (Harvard Square); Japanese, lunch Monday-Saturday, dinner daily. Taiwan Cafe, 34 Oxford Street (Chinatown); Taiwanese, lunch, dinner and late night daily. Mike’s City Diner, 1714 Washington Street (South End); American, breakfast daily, lunch Monday-Friday. Picco, 513 Tremont Street (South End); Italian, lunch and dinner daily. Original Regina Pizzeria, 11 1/2 Thacher Street (North End); pizza, lunch and dinner daily. Blue Dragon, 324 A Street (Fort Point); Asian, lunch Monday-Friday, dinner and late night Monday-Saturday, closed Sunday. Dumpling Cafe, 695 Washington Street (Chinatown); Taiwanese, lunch, dinner and late night daily. Henrietta’s Table, The Charles Hotel, 1 Bennett Street, Cambridge, MA (Harvard Square); New England, breakfast daily, lunch Monday-Friday, brunch and dinner Saturday-Sunday. Bar Boulud, Mandarin Oriental, 776 Boylston Street (Back Bay); French, breakfast and dinner daily, lunch Monday-Saturday, brunch Sunday. Meritage Restaurant + Wine Bar, Boston Harbor Hotel, 70 Rowes Wharf (Waterfront); new American, dinner only Tuesday-Saturday, closed Sunday-Monday. Boston Duck Tours, departs from Museum of Science, Prudential Center and New England Aquarium; operates daily. About the Chef: A management consultant turned pastry chef, restaurant owner and cookbook author, Joanne Chang has built quite the culinary career over the past two decades. After starting her career as a garde-manger cook at Boston’s Biba restaurant, she eventually worked her way up to pastry chef at Rialto and Mistral. She now boasts four locations of the beloved Flour Bakery + Cafe, and in 2007, she and her husband Christopher Myers opened Myers + Chang, a Chinese restaurant inspired by the traditional recipes Chang learned from her mother and aunt. Boston has been home for Chang since her Harvard undergrad days, with the exception of a yearlong stint in New York City working at Payard Patisserie and Bistro. For her, it just made sense to plant her roots and start her businesses in the city she knew and loved, and she’s since become a fixture in Boston’s dining scene.